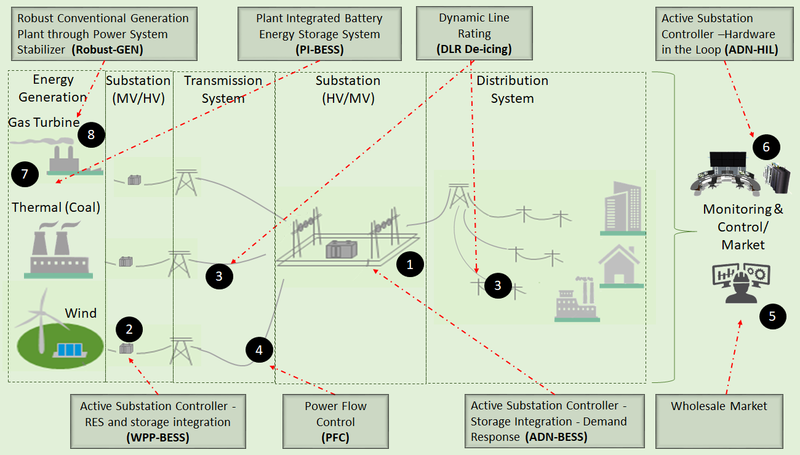 FLEXITRANSTORE (An Integrated Platform for Increased FLEXIbility in smart TRANSmission grids with STORage Entities and large penetration of Renewable Energy Sources) aims to contribute to the evolution towards a pan-European transmission network with high flexibility and high interconnection levels. This will facilitate the transformation of the current energy production mix by hosting an increasing share of renewable energy sources. Novel smart grid technologies, control and storage methods and new market approaches will be developed, installed, demonstrated and tested introducing flexibility to the European power system. FLEXITRANSTORE will promote increased cross-border electricity flows using the valorization of flexibility services. The project takes both a national and a regional approach, acknowledging the need to seamlessly integrate national markets, particularly in the South Eastern European network, which still lacks the high interconnectivity that the rest of the European network has. The FLEXITRANSTORE project is in line with the ETIP-SNET 10 year R&I Roadmap and the ENTSO-E R&I Roadmap 2017-2026, which identify the main evolutions of the power systems in the decades to come. These evolutions include an ever-increasing penetration of Distributed Renewable Sources and controllable Distributed Loads. The objectives of FLEXITRANSTORE are complementary to the R&I Roadmaps and will impact both new and existing market participants. FLEXITRANSTORE will provide the necessary technical and market advancements to facilitate the safe and seamless transition towards this new era. FLEXITRANSTORE will develop a next generation Flexible Energy Grid (FEG) which will be integrated into the European Internal Energy Market (IEM), through the valorization of flexibility services. This FEG addresses the capabilities of a power system to maintain continuous service in face of rapid and large swings in supply or demand. Thus, a wholesale market infrastructure and new business models within this integrated FEG should be upgraded to network players, offering incentives to new ones to join, while demonstrating new business perspectives for cross-border resources management and energy trading. FLEXITRANSTORE will transform the European Power System through interventions that target the whole Energy Value Chain.